1987 – Sugar Free Recipes was written, illustrated and published by Gloria Pitzer (Secret Recipes, St. Clair, MI). NO LONGER IN PRINT – this cookbook has a 120-page, 5.5″ x 8.5″ format with about 400, simple-to-prepare, sugar-free recipes for breads, muffins, donuts, pies, cakes, puddings, main dishes, salads & dressings, dry mixes, spices & seasonings! This limited edition sold for 1 year at $6 per copy. Keep in mind, Gloria does not count calories, carbohydrates or any other elements; but, this collection includes some of the best desserts that you will ever find – made without sugar! 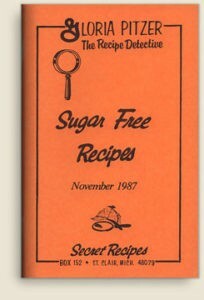 The sugar substitutes that Gloria prefers are specifically given by brand name in most recipes where substitutes might pose a problem. Heat breaks down the intensity of sweetness in many of these, so Gloria liked to be specific.